Scientists at The University of Manchester have developed software for mobile phones that can track your facial features in real-time. Eventually it will be able to tell who the user is, where they are looking and even how they are feeling. The method is believed to be unrivalled for speed and accuracy and could lead to facial recognition replacing passwords and PIN numbers to log into internet sites from a mobile phone. "Existing mobile face trackers give only an approximate position and scale of the face," said Dr Phil Tresadern, lead researcher on the project. "Our model runs in real-time and accurately tracks a number of landmarks on and around the face such as the eyes, nose, mouth and jaw line. "A mobile phone with a camera on the front captures a video of your face and tracks twenty-two facial features. This can make face recognition more accurate, and has great potential for novel ways of interacting with your phone." Originally intended as part of a face- and voice-verification system for access to mobile internet applications such as email, social networking and online banking, alternative uses for the device could include fun applications that, for instance, attach virtual objects to the user's face as they move around. "At this stage, we're particularly interested in demonstrating uses for the face-tracking part of the technology, which is the area The University of Manchester is involved in," said Dr Tresadern, who is based in Manchester's School of Cancer and Enabling Sciences. "It is very fast and I can't find anything that can rival it on a mobile phone." Face verification is already used in laptops, webcams and the Xbox 360 Kinect but this is the first time the technology is being used with such sophistication in mobile devices such as smartphones. 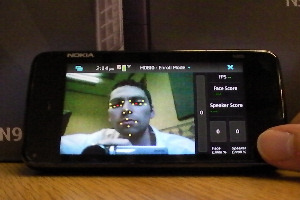 The new software, built on 20 years of research at the University, has been demonstrated on a Nokia N900 for the EU-funded "Mobile Biometrics" (MoBio) project.